LTD. STOCK / ONLY 1 COPY PER ORDER PLEASE !!! 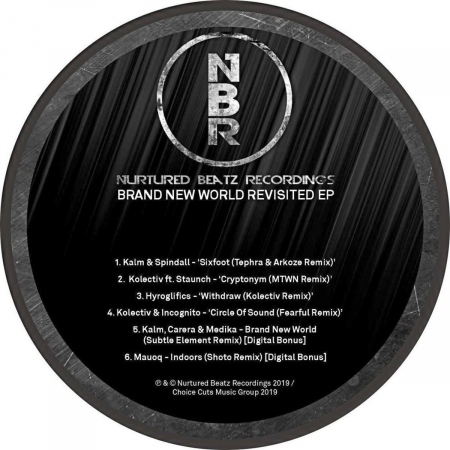 - Nurtured Beatz Recordings' latest remix compilation EP is due to hit the stores early 2019. Releasing on vinyl and accompanied by a digital release, with 2 bonus tracks for those purchasing the full & vinyl versions. progressive drum & bass producer outfits whose previous releases are on Diffrent Music, Citrus and Proximity Recordings. Finally, last but not least Fearful another rising artist currently releasing his debut solo LP on Diffrent Music (November 2018) who has remixed Kolectiv & Incognitos massive 'Circle OF Sound' track. This has a grimier feel than its predecessor, with ripping synths, gut wrenching bass and rolling drums Tephra & Arkose's remix of Kalm & Spindall's 'Sixfoot' (side A 1) moves away from their more typical minimal rollers and takes on a darker jungle vibe, with reverberating vocal samples. Kolectiv's track 'Cryptonym' remixed by MTWN (side A2) is a quite a contrast and has classic dark rolling bass, with a sharp cutting snares and chopping break edits. Kolectiv's remix of Hyroglifics (Side B1) has rolling, rhythmic vibes with a murky groove.